Today, I am super excited...but first the bad news (well, bad for you, good for us). Rate Your Story is now closed to submissions until August 8. We're hosting and attending writing conferences. So write and revise, then spit-shine and be ready for when we re-open. Now, it's all good news from here on out. And the voting results for our new logo are in! By an overwhelming margin, you chose the Rate Your Story logo with the manuscript and feather pen. The wonderfully talented Dana Atnip is working on finalizing it now. 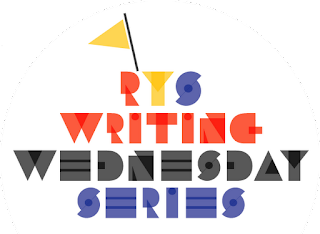 Next, another RYS user, Julie Rowan-Zoch volunteered her time and surprised me with this, a Writing Wednesday badge! Apparently, she made the font! I am a huge fan of fonts, so this is very special to me. I hope you'll also share this badge by placing it on your blog and linking to our site. Thanks for adding this to your site! As if that weren't enough news, there's still the main reason for this post. Our actual Writing Wednesday article! I am very excited to welcome a seasoned Rate Your Story submitter and personal member of an online critique group of mine as today's guest poster. She's got a great perspective on how to use this site in conjunction with other critiques and evaluations when you're stuck with a particular manuscript, or getting conflicting feedback. As writers, the one thing we often hear is that you NEED to be in a critique group. After all, one can only self-analyze their own work so much. I participate in two critique groups that have different levels of authors. I love the diversity because I get different criticisms and compliments. But sometimes I wonder what it would be like to be in a critique group with a Karma Wilson, Bonnie Becker, or Doreen Cronin - folks who have established themselves as picture book authors. If they were reading my story, what would their comments be – needs tightening, leave more space for illustrations, or needs more character depth? Maybe (I can dream) they’d say it was even brilliant. This is where Rate Your Story, RYS, comes in. They have established authors to review our submissions. I use them as my litmus test. Litmus test - (n) a crucial and revealing test in which there is one decisive factor. Whenever I really get stuck about something in my story and am not sure which way to go, I send it in to RYS. I rely upon the feedback to help me decide my next step. The first story I ever written had gotten shredded at a round-table critique at SCBWI. I was told what I had written was NOT a picture book, but possibly an early reader. I was shocked as it had been already been critiqued by my writer’s group, who felt it had potential as a picture book. I shoved the story in a drawer for six months. When I heard about RYS during the winter, I sent in my story. I needed to know if it really wasn’t a picture book. I was expecting a nine or ten, that way I would know to stop working on it. Instead I got a seven, I was thrilled. Also the wonderful reviewer did line-edits showing me how to fix various aspects of the story. For that I am grateful. A few months later, I circulated a second story through my critique groups. This time my fellow writers said it needed a little more “oomph” - more tension and character. I had a hard time accepting this since it was a concept book. So, I sent the story into RYS. This time I got a four. I was pleasantly surprised. However, there was a gotcha; the reviewer felt the story needed some more oomph too. AARGH!! That is how I felt for the first 24 hours; my poor husband can probably still remember me ranting. I thought “why does nobody get that this is a concept book. Why do they expect something else to be in it?” But after processing the comments from the critique group and RYS, I had my “A-ha” moment and added another layer, now making it a story-driven concept book. What I have discovered about myself is that the hardest comments to hear are the ones that I need the most and sometimes I need to hear those comments from more than one source. I feel fortunate to have two wonderful critique groups and RYS to help me improve my craft. You should consider using RYS as a litmus test on your next story. Darshana Khiani works in high-tech by day and dreams of becoming a published author by night. Her favorite activity is browsing the picture book shelves of her local library searching for the next great story. Check out her book reviews at Flowering Minds, and keep up to date on the latest in the kidlit world by “Liking” her on FaceBook. Comments are OPEN! Hope to hear from you and we'll see you next week for another awesome Writing Wednesday article. Julie, your badge is awesome! Once I'm done here I'm going to add it to my site. Thanks Darshana for sharing. I completely agree "that the hardest comments to hear are the ones that I need the most". yes, even though they are really hard to hear I am glad we have critique partners and services like RYS to tell us. Anyways, thanks for the great post...You guys are super! Darshana - I completely appreciate your post! I also reply on RYS as a litmus test from an objective reviewer who does not know me, my prior work, or feel obligated to color their feedback in any way. I love the variety of reviewers who have commented on my submissions - much broader in genre and experience than my usual CPs. I also have a concept book that I am very excited about, but am struggling to seamlessly incorporate a logical story element. Here's to AHA moments and more OOMPH! yes it is challenging to incorporate a story line after the fact, but it can be done. Don't stress about it, I know your AHA moment will come. I like the badge and the logo! Thanks Donna, glad you like the post. Wise words, Darshana! It's so true that what you don't want to hear is so often what you NEED to know the most. Thank goodness for a little humbling in this business. And Julie! LOVE your graphic for Writing Wednesday. VIVACIOUS! Yes, which is why I need to hear it multiple times especially since this is a subjective business. Excellent post, Darshana. I think you definitely hit the mark with your "litmus test" advice. I have used RYS for two of my manuscripts. I was very pleased with the service and am so appreciative of the judges who give their time and expertise. Thanks Penny! Yes I don't know where my writing would be without RYS. Thank you Darshana for leading me to this site. (I saw your note on facebook). I haven't used RYS yet but I'll start polishing my manuscripts in preparation for August 8. Cool! Good luck with your MS! I do love the winning badge...can't wait to see it in its final form! Thanks. Glad you are getting so much out of RYS as I have. They are a great bunch of generous folks. Even tho I'm great at giving critiques, I'm not so good at receiving them. The problem is that we need to be sensitive as creatives, which usually means being thin skinned. But then we need to be thick skinned in receiving criticism and getting through rejection. Often this means separating ourselves out from our work and pretending that it's someone else's work and not our tender babies that are being rejected. It's not us but it's our work that either needs revising (which pretty much all work does, especially in the beginning) or our project just doesn't resonate with that reviewer, editor, or agent. I submitted a piece years ago that was rejected a bunch of times and then a big publisher said they loved it but didn't like my color palette so I said no. Flash forward a decade or so, and I've learned tons including that the initial editors were correct and the concept was fundamentally flawed. I'm grateful that it wasn't published as it would have received awful reviews tarnishing my reputation forever. I hope this helps some of you struggling with rejection or the news that you need to revise. It's part of our craft to get those skins balanced. Gald you liked the post. Thanks for sharing your experience, insightful. I too am very appreciative of RYS. I can see how RYS is a valuable asset for writers. Is RYS just as beneficial to writer/illustrators? I wonder, because sometimes illustrators tell their stories in pictures, and use words sparingly. Sorry, just wondering. I find I have to explain (or have sketches) to help my critique buddies understand my pbs. Brenda, very good question. Hmm, I would like to know the answer to that too. A terrific post from a very talented writer! I agree, Darshana, that the outside, experienced voices of RYS are a godsend to sort out the "next steps" when we receive conflicting advice from our critique group(s). Thanks for stopping by. Glad to hear you are able to use RYS for your writing. Awesome badge, Julie! And RYS rocks. Thanks for a great post, Darshana - so true that the hardest comments to hear are the ones you need most!